Does an Infrared Laparoscope bring better visual field under the bleeding situation? Back ground: The bleeding during the laparoscopic surgery adds much stress to the surgeons. 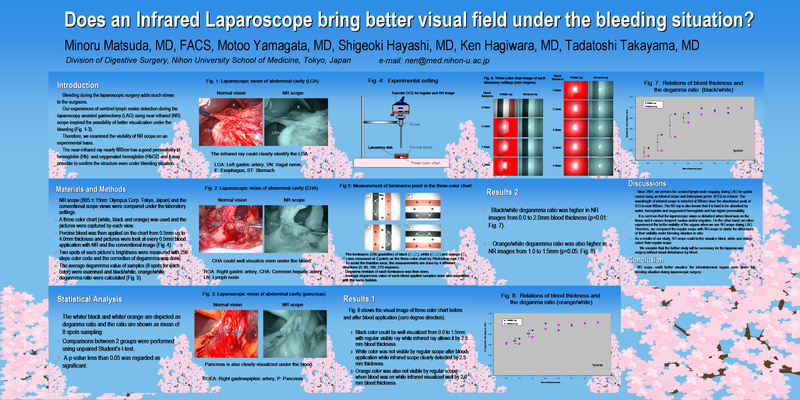 Our experiences of near-infrared (NR) laparoscope that used for sentinel lymphnodes detection inspired the possibility of better visualization under the bleeding situation. Therefore, we examined the visibility of NR scope on an experimental basis. Materials and Methods: NR scope (805}15nm: Olympus Corp.) and the conventional scope views were compared under the laboratory settings. A three-color chart (white, black and orange) was used and the pictures were captured by each scope. Then porcine blood was applied on the chart from 0.5mm up to 4.0mm thickness and pictures were took at every 0.5mm blood application with NR and the conventional image. Two spots of each picturefs brightness were measured with 256 steps color code and correction of deganmma was done. The average deganmma value of each samples (8 spots) were examined and black/white, orange/white deganmma ratio were calculated.